If you're thinking of getting into Vintage Racing, why not let Bill Terry's years of experience work for you? We can supply all your racing needs. From the complete High Performance Engine to get you going as fast as possible, to Hi-Tech brake pads to stop you sure and fast! E-mail Bill direct at Bill@TerrysJag.com with your specific needs. First and foremost everyone from Terry’s would like to thank the Stephens’ family for all the wonderful hospitality we received at the Hallet track. Mike’s wife, Connie, sons Shayne and Scott were great host and made us all feel more than welcome. It was a sobering moment to see the old red #88 Jaguar without Mike’s smiling face leaning over the engine or behind the wheel. We will all miss him immensely. 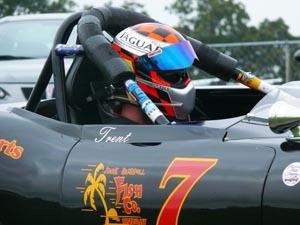 In the first race on Saturday, Trent lined the black ’66 Jaguar XKE up on the pole position. There were several awesome muscle cars present, some as fast as they looked. Straight out on the first turn, with a little help from behind, Trent spun out. After a driver through the pit, a brief but pleasant chat with the track marshal, Trent headed back out on the course. An ultra sharp white ‘690 Corvette driven by Jody O’Donnell and a super hot ’67 blue Camaro driven by Samuel Le Comte were tearing up the 1.8 mile road course. With wit and experience, Trent patiently worked his way up through the tough field and placed 2nd behind the 69 vet. Trent seemed to make several of the other drivers a little nervous with his driving tactics. More than one driver lost concentration and took to the grass after the one on one with Trent. Now, one would think that with all of the years of racing experience with Trent and Bill combined, lack of equipment would never be a concern with the Terry’s Team. Did I mention that only set of tires we had are the ones on the car? 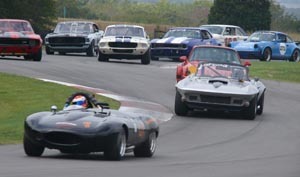 The second race of Saturday, the black Jag aw the tail end of the ’69 vet at the start of the race. The crew noticed that the vet had a 5-way rearview mirror. “I don’t think he’s going to like seeing 5 of Trent behind him!” seemed to be a rather fitting statement from Kevin Russell as the line up began. That distraction didn’t last long for O’Donnell. Within the first lap, the white vet was off the track and Trent and the black 77 were way out in front, 7 seconds to be exact. In this race, the blue ’67 Camaro showed his seed with lap times as good as or even slightly better than Trent’s. The Jag was getting a littler slower each lap. Did I mention tires? Thank God he’s good. Trent pulled off the victory and secured his spot in the Sunday race. Not so bright, but early Sunday morning, the Terry’s team arrived at the track. So far, so good, the Terry’s luck was taking the good turn. No malfunctions with the car. All was great. The line up for the group one race went underway. Trent and the black jag in 1st, the ’67 blue Camaro in 2nd. Just before the race, with the track sign flashing “play nice”, the track marshal gave the top 3 starters a little pep talk. “This race isn’t going to be one in turn one boys, play nice and take it easy!” With Mike’s son driving the red #88 Jaguar for the pace car, it was time for the big show. Trent said he knew that the Camaro could out drag race him into turn one, so he figured to let him take it there. The green flag went out and off they went. Trent said they both went had into one, he hew where he had to break and said the Camaro shoed all out well past his brake point. He knew the camaro wasn’t coming out the other side on one. It was all Trent and the black Jag throughout the race. All the crew knew was to pray that the tires held out. With a little luck and a lot of skill on the drivers part, Terry’s ’66 Jaguar XKE made winning the race look easy. Did you know racing is fun when everything goes well? We’d like to thank again the Mike Stephen’s family for hosting a wonderful event at the Hallet Raceway. Mike was an unforgettable man who will be greatly missed by not only everyone at Terry’s Jaguar, but all that knew him.